Leonardo is the owner of this Norton; it used to belong to his father who won a few races on this one. Simon: "I looked it up in the Works Records. It's a Model 40. Engine number 24XX. Frame number 509XX. Gearbox: racing Sturmey-Archer 4-speeder, number 10796. Magneto Number 385920 (looks like BTH). Forks number 8989. TT Specification - tuned. Despatched 20/9/33 through the London based Export Merchants Agar Cross. This company dealt exclusively with South America so it is no surprise that this bike is in Argentina." John: "The Norton has matching frame, engine and gearbox numbers. Note the racing goodies like the megaphone exhaust and rubber Dunlop saddle. It's a bit of a mess but very original. 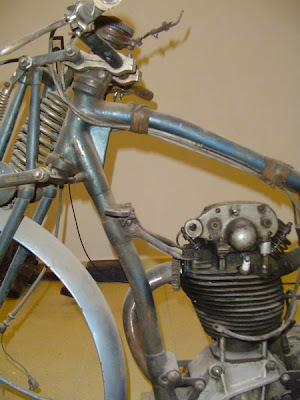 See the pic below; that front downtube had another shape when it left the Works!